How can we make sure Peoria Music Live promotes our show? We get the question a lot and the answer is pretty simple! Step 1. Create a Facebook Event from your ARTIST, BAND, or VENUE page. Step 2. In that event, add Peoria Music Live as a co-host. For the most part, it's that easy! If you don't have and ARTIST, BAND, or VENUE page, send us all of the info for the show and a photo to use and we'll create an event for you, adding you as a co-host so that you can have control of the event. ClusterPluck Aug 25, 2018 Pour Bros Craft Taproom Courtyard Concert Series. We love that Pour Bros has added us as a co-host to every show this summer so that we can make sure people know about the fun and family friendly event every week! If you create it from your PAGE and Peoria Music Live does not come up as an option to add as co-host, you are probably on a mobile device. You have two options. The best and easiest option for us is for you to try again from a computer. If that isn't an option, the next best way to add PML is to make sure you are my Facebook friend ( Kindall Nelson ) and add me as a co-host. Then, when I am back at my computer I can accept the co-host spot and add PML*. *I don't mind doing this, but it isn't a quick process. Often, shows get missed. So, if you do it this way and PML isn't added within 24 hours... message me a link to the event page so I can fix it. Who else should co-host the shows? Best case scenario, all the bands included in the show should be co-hosts, the venue, any sponsors of the show, and Peoria Music Live. It's always better to have one event with all of the bands listed than it is for each band to create their own event. This gives the event more engagement, which encourages Facebook algorithms to put it in front of more people. It doesn't always work out that way, and we'll work with whoever is willing to add us. Trailer Parke had the dance floor full at Martini's! Aug 25, 2018 These guys have been very supportive of Peoria Music Live since the beginning. As soon as you create the event... which you should do as soon as you book the event! The sooner it is on our list, the more times it will be put in front of our followers. Also, we schedule posts ahead, sometimes a week in advance... so if you don't add PML until the day before the show, your show might not make all of the lists or get any extra posts. We strive to post the weekend master list on Wednesdays and it is difficult to add things after that point. Late is better than never... and I will always do what I can, but there are no guarantees about anything being posted if we don't get a co-host request until Wednesday or later. Where can the shows be? Why must PML to be added as a co-host? First, that is the easiest way to get it on our events list. There are so many shows going on every week, and I have so much going on, that if it isn't on our events list... I probably don't know about it. Brian Larson & Shawn Shawn Soens of Gary's in Trouble. Second, that event list is the list we use to create all of our daily posts and decide who we go see when we head out to see live music. This means that to end up on our YouTube, Instagram, or Facebook Live, you need to be on the list! 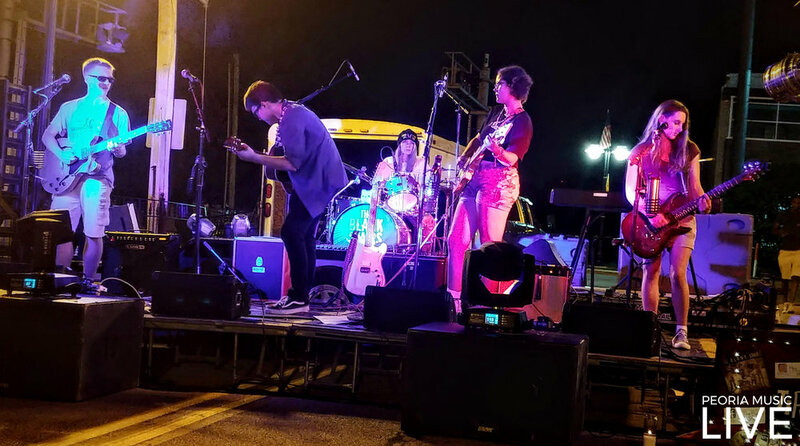 Third, adding us as a co-host not only makes it easier for us, but it also helps make Peoria Music Live a recognizable name so that people will come to us to look for live local music in Peoria. So, while we are helping you by promoting the show, you are also helping live local music in general by reinforcing to people that they should be checking out Peoria Music Live if they want to know what is going on in the area! You are helping out your future shows by adding us today! While you all continue to thank us for what PML does, adding us as a co-host is saying "Thank you!" to Peoria Music Live! Peoria Music Live's posts reached 40,000 people last week. It wouldn't be possible without your help! THANK YOU! Whiskey Bent was moved inside at Kelleher's due to the threat of storms. It was only their second show and they were impressive. Check out PML's video on YouTube.